Resting among the awe-inspiring Black Hills of South Dakota, Mount Rushmore and Crazy Horse tell the complex story of the founding of American democracy. Their co-existence within these mountains, the sacred lands of the Great Sioux Nation, is highly symbolic of the controversy surrounding European settlers’ brutal conquering of Native American land. Carved out of the side of a granite mountain in the Black Hills of South Dakota, Mount Rushmore was built as a memorial to the story of democracy in America. The country’s most famous monument is visited by nearly two million people each year; many come for its impressive scale and astounding beauty and leave with a new understanding of the spiritual significance of this land. What is often lost when one considers Mount Rushmore outside of the context of the Black Hills, is the sculpture’s symbolic ties to the Native American tribes who once lived within this stunning expanse of country. 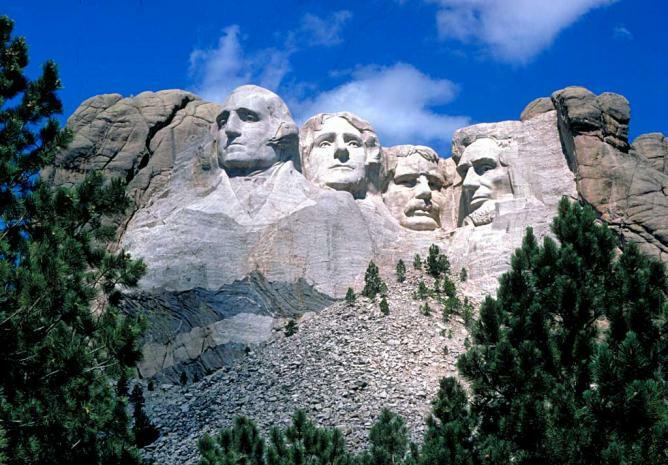 The idea to build a memorial dedicated to four of the greatest American presidents was conceived of by Doane Robinson of the South Dakota Historical Society in order to attract tourism to the state. 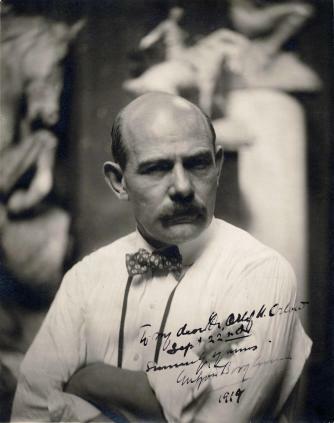 He approached the artist Gutzon Borglum to craft the design for the project, who subsequently selected as a site the piece of mountain known to the Native American Indians as the Six Grandfathers. During a 14-year period workers buldozed, blazed and chiselled the towering 60-ft tall heads of George Washington, Thomas Jefferson, Theodore Roosevelt and Abraham Lincoln into the fabric of the earth’s surface. Started in October of 1927, Borglum spent the remaining years of his life dedicated to his masterpiece, until his death in 1941. The artist, son of Mormon Danish immigrants who practiced religious polygamy, selected the four figures for their symbolic significance. George Washington was chosen for his commitment to the independence of the country, Thomas Jefferson for his struggle to create a government for and by the people, Abraham Lincoln for his ideas on equality and dedication to the union, and Theodore Roosevelt for his active role in United States foreign affairs. The monument is truly American in its ardor, immensity and chosen subject matter. Yet this iconic mountain has a complex history and is seen by many as a looming reminder of the white man’s betrayal of the Native American people. Conflict between the American government and the Lakota tribes of the Great Sioux Nation, long time occupiers of the Paha Sapa, or the Black Hills, lasted longer than any other of the American Westward conquest. An 1864 treaty made these sacred hills part of the Great Sioux Reservation, but the presence of gold in the area lead to the complete disregard of this agreement, as General Custer brought in the gold rush in 1874. In 1948 Lakota chief Standing Bear commissioned an alternative sculpture just a few miles from the site of Mount Rushmore. He did so stating his desire to let the “white man know, that the red man has great heroes too.” The sculpture, depicting revered Lakota chief Crazy Horse, will stand at 563 ft high and 641 long once completed, and will exist as the largest monument in the world. Choosing Polish-American sculptor Korczak Ziolkowski for the task, Standing Bear requested that the endeavor be a non-profit, educational and cultural humanitarian project, financed by donations of the public rather than through government funding. Although the US government twice offered sums of 10 million dollars’ worth of federal aid, Ziolkowski kept his word to the Lakota chief, and denied the gift. In addition to the sculpture itself, the humanitarian vision for the site includes the Indian Museum of North America, as well as the University and medical training centre for the North American Indian. Ziolkowski initially suggested that he produce the monument in the hills of Wyoming because the stone there could be more easily carved, but Standing Bear insisted that it rest amongst the Black Hills as a reminder of the remarkable people who once roamed this land. 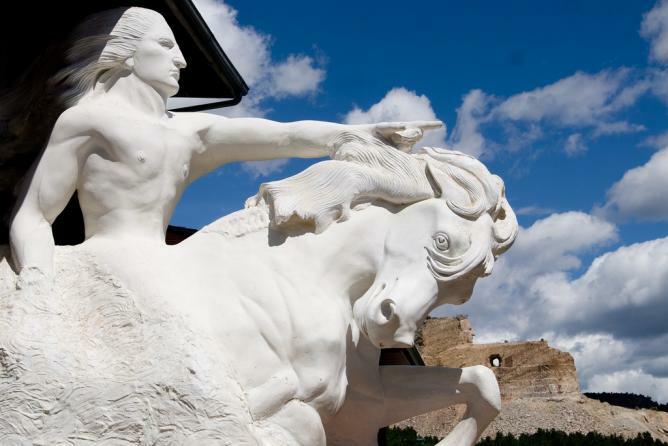 Crazy Horse was selected as the subject for his extreme demonstration of resistance against the defeat of his people, and his willingness to give his own life for those in his community. This elusive figure resisted being photographed and requested to be buried without a headstone where he would not be found. His ancestors recognise his spirit in the land itself, and his immortalisation within the mountain is a metaphoric tribute to this spirit. Said to have proclaimed: “My lands are where my dead lay buried”, his outstretched arm reaching towards the horizon is emblematic of this declaration. Following 36 years of lone dedicated service to the memorial, Ziolkowski died in 1982. In his wake, his legacy has been carried out by his children who, like their father, have given their lives to this cause. 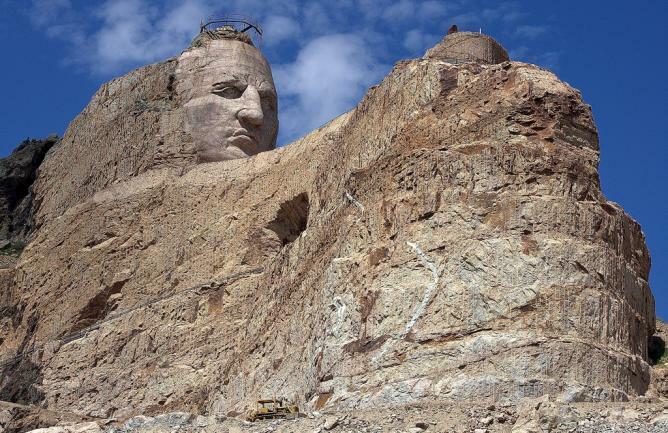 Although much progress has been made in the years since work was begun, Crazy Horse is likely to take several more lifetimes to complete. Well aware of the scale of the undertaking, the sculptor laid out extensive plans for those who would follow him. In 2004 Mount Rushmore National Memorial appointed Gerard Baker as the first American Indian superintendent of the grounds of the presidential monument. By educating visitors on the Native people who once lived on these lands, Baker hopes to generate a broader view by presented multiple sides of Mount Rushmore’s layered history. Through his dedication to the project, Baker has visited reservations to speak with tribes about what stories they would like told. In addition, Rushmore now has Lakota teepees where Native American guides offer visitors the tales of their ancestors, and audio guides are available in the Lakota language. The vision of Mount Rushmore as a monument to democracy extends beyond the story of the four presidents to all of those individuals that are directly or indirectly represented by them. By generating understanding, Baker hopes to encourage the healing process between the descendents of these American Indians and European settlers who now collectively call themselves Americans.